Smart fabrics made from low-cost electronic yarn could lead to a revolution in biomonitoring. 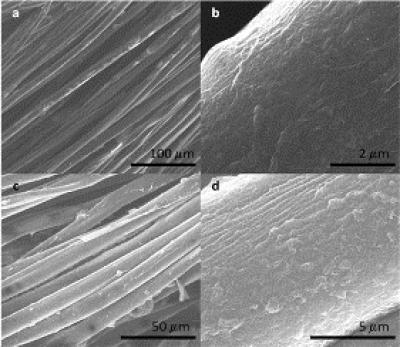 In a new study, Nicholas A. Kotov, Chuanlai Xu, and colleagues describe the development of cotton fibers coated with electrolytes and carbon nanotubes (CNT). The fibers are soft and flexible, like a natural fiber; however, these tiny filaments can conduct electricity when woven into fabrics. In laboratory tests, the researchers showed that the new E-fibers could light up a simple light-emitting diode when connected to a battery. When coated with certain antibodies, the fibers detected the presence of albumin, a key protein in blood — a function that could be used to detect bleeding in wounded soldiers. The fabrics could also help monitor diseases and vital signs, they say. "It can feel your heartbeat … look..."